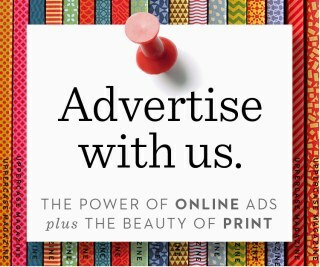 We all have at some point of life desired to control everything at the click of a button. May it be turning off unnecessary lights when you are not at home to detecting intruders when you are not around. This tutorial will guide you to build a simple raspberry pi home automation system that will allow you to control appliances in your home from anywhere in the world. And it will also allow you to view data from the PIR motion sensor via the internet to detect intruders. This project will be using platforms like the Raspberry Pi, IBM’s IoTF (Internet of Things Foundation) and Bluemix packages. And can be used as a perfect project to get into the world of Internet of Things. So lets get started! What are the stuff required to do this project? Raspberry Pi 2 / B+. Micro USB power adapter (smartphone charger). 5V SPDT relay and 1n4001 diode. The server side script running on our laptop or on a web server takes input commands from the user and correspondingly sends it to the client (Raspberry Pi). Here, we will be using commands to turn a light ON/OFF. When we pass the command to turn ON a light through the server side script, the information is relayed to the Raspberry Pi and it’s GPIO pin turns ON a relay. The system also sends status updates to the server on whether the light is ON/OFF. 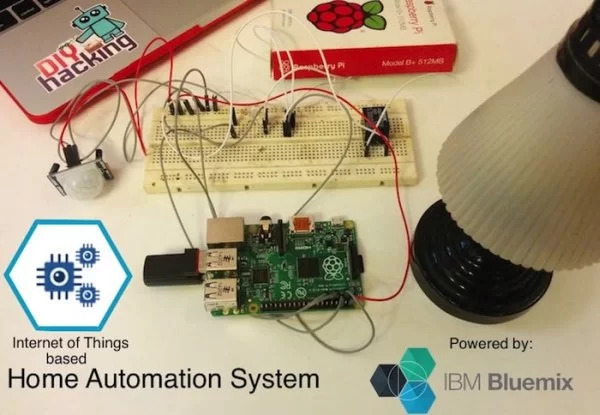 In case of sending data from the PIR motion sensor connected to the Raspberry Pi, we run a script which reads the sensor through a GPIO pin and broadcasts the data through the IoTF platform. This can then be viewed through the IoTF console or through a custom web application designed using the platform. Creating applications using bluemix: documentation. 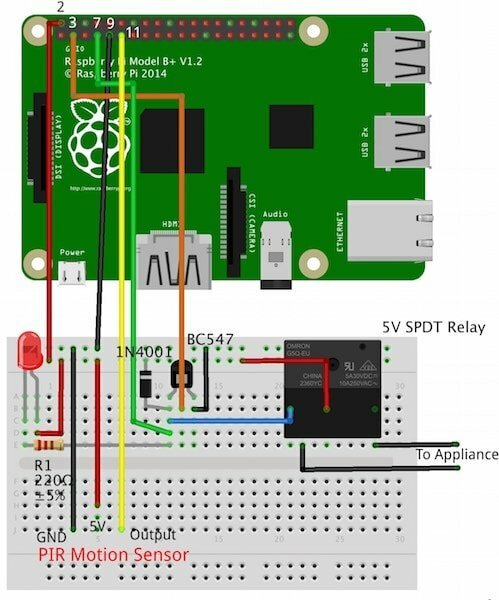 Interfacing Raspberry Pi with an accelerometer sensor: IBM blog. Then from the new window that pops up, follow the instructions to setup the simulator or just click this link: “http://quickstart.internetofthings.ibmcloud.com/iotsensor“. Next, copy the MAC address from the top right corner of the simulator. Here, in this example it is: DD:2D:36:E1:C0:17. Now, paste this MAC address on the IoTF quickstart page: https://quickstart.internetofthings.ibmcloud.com/#/ or just click on the MAC address itself. You can see the data coming from the simulator in this new tab in the form of a graph. Now go back to the simulator and click on the UP/DOWN arrows on it to increase/decrease the value of temperature. And you will get to see that the graph on the quickstart page updates accordingly, and at the bottom of the page you will see the current value of temperature you have set. “service iot getdeviceid”. Note down the device ID. Next log into the Bluemix console: https://console.ng.bluemix.net/ and then click on “Add Service” or “Use Service”. FYI – From next time onwards, you can just log into the IoTF page and click on the top right account section. A dropdown will come up, from there you will see “My organizations”. Click on the that,which will take you to a new page. Now, after launching the dashboard, select “Devices” from the above tabs. Then click on “+Add Device” from the page. Fill in the name of your device (anything that you want to name it) and then enter the device ID you got from the earlier steps. After doing this, you will get a Token id, please note it down or take a screenshot of the window. You will be using this Token id to create a configuration file. Next you have to follow the steps listed under the heading: “Connect (Registered)” on this page: https://developer.ibm.com/iotfoundation/recipes/raspberry-pi/. This will initialise your Raspberry Pi with details like Organization id, Device id, Token, etc so that we can communicate with it through other applications. Now you need to create an API key for the Raspberry Pi, so that we can read data from it through other external applications. Click on the “API Keys” tab on your organisation page and click on “New API Key”. Note down the key and authentication token that is generated, this will be shown only one time, so note it down or take a picture. Use RPi, Azure, and Cortana to Automate your Home!